St Andrew's College was founded by the Presbyterian community of Dublin in 1894 to provide a broadly-based, liberal education in the Christian tradition for the sons of its members and those of other parents who wished their children to attend. From its inception, the College attracted students from a variety of backgrounds and strove to unite them through a shared experience of working, learning and playing together. St Andrew's was, in effect, an 'integrated’ school and it remains so today. Since its foundation the College has evolved in many ways, and is now a flourishing international, inter-denominational, co-educational school of approximately 1,250 pupils and just over 100 teachers. 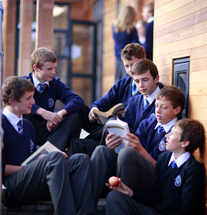 The College offers a wide range of academic programmes such as the Irish Primary curriculum in the Junior school, and the Irish Junior Certificate, Transition year and Leaving Certificate programmes at secondary level. The College also offers a wide range of sporting, creative, cultural and other extra-curricular activities. The distinctive international character to St Andrew’s College is reflected in our provision of the International Baccalaureate programme and our American High School Counselling Service. This international character is further reflected in the College’s Model United Nations programme as well as in the provision of our English as an Additional Language programme and in events such as Intercultural week. The high quality of the education offered by the College and its commitment to continuous improvement are reflected in the fact that since 1984 St Andrew's has been fully accredited by the Council of International Schools and the New England Association of Schools and Colleges. The philosophy on which the College was founded and from which it draws its inspiration today is that a high-quality, rounded education is essential for the moral, social, spiritual, cultural and academic development of all students. Such an education supports the physical and mental well-being of the student and actively contributes to the health and prosperity of society as a whole. It is the belief of the College authorities that the principles of the Christian tradition offer a sound basis for the cultivation of such universally-valued qualities as honesty, integrity and concern for the welfare of others. They also believe that active participation in all aspects of College life promotes the socialization of children and prepares them to play their full part as questioning citizens in a democratic society. Similarly, access to a wide range of cultural and academic pursuits is believed to stimulate and nourish the child’s creative and intellectual capabilities, thereby enabling him or her to achieve a high degree of personal fulfilment. The basic tenets and philosophy of the St Andrew’s College community are believed to remain as relevant to the personal and social development and well-being of our students as they were when the College was founded.